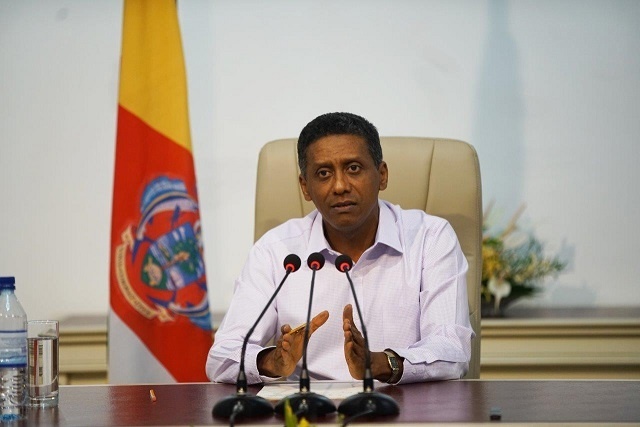 (Seychelles News Agency) - The President of Seychelles, Danny Faure, held his second live press conference of 2018 on Monday evening, the sixth of his presidency at State House, Victoria. SNA brings an overview of the issues discussed. Faure said that a quota system for foreign workers will be set up to regulate the number of foreign workers entering the country. Training institutions have been set up as well to train Seychellois workers to take up positions currently occupied by the foreign workers, he said. President Faure said, “It has been confirmed that all staff being laid-off will receive a six-month package including the allowances,” said Faure. Air Seychelles confirmed last week that 126 staff will be made redundant instead of the around 174 announced earlier this year. Faure said the issue of a military base on Assumption island that would also be used by India will not be discussed with Indian Prime Minister Narendra Modi on his state visit to India later this month. Faure said that the Assumption project will not move forward. “In next year’s budget, we will put funds for us to build a coastguard facility on Assumption ourselves. It is important for us to ensure that we have a military post in this area,” he said. Since Seychelles and India signed an agreement earlier this year to build military facilities on the remote island of Assumption, the project quickly became controversial, with the government supporting the plan but opposition members in the National Assembly and many private citizens against it. Faure said that he will not pronounce himself on the subject as he had signed an agreement not to criticise the other two heads of the branches of the Seychelles’ state structure, which are the legislative and the judiciary. Faure said that the recent reshuffle on April 27 did not include that of the principal secretaries and chief executives. “All changes have been done at the head of the ministries. Therefore this should not affect the work of the government,” he said. Faure said that although there will be changes in the government, there needs to be continuity in the work and the priorities should not change.